Now that you’ve built your dream garage, it is time to make this fabulous new addition functional, satisfying all of your needs. Note: It is important to add all storage items and accessories before you begin moving anything into your brand new detached garage. Otherwise, the clutter might take over before you’ve even had a chance to begin organizing the garage in a useful and efficient manner. One rule of thumb to follow: Think vertical! From floor to ceiling, capitalize on vertical space keeping the parking and walking areas free and clear for easy movement. 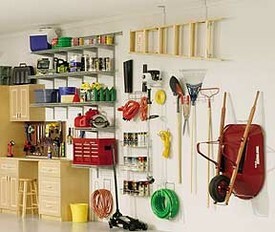 There is a wide range of wall accessories to maximize your garage storage safely. Pegboards and hooks deliver plenty of vertical storage space and cabinets can be easily arranged to offer floor and overhead cabinets with a countertop or work bench resting on top of the floor units. Both pegboards and hooks can be arranged to fit any size garage. Another good choice for storage is a slotted panel system which combines the use of hooks, shelves and cabinets. No matter which organizational method you choose for your walls, make sure each piece or item is securely mounted to the wall and do not store anything that exceeds the maximum weight capacity. Though we don’t traditionally use the ceiling for storage in our homes, the garage is one place where you can make use of the space above. In many cases, hooks can be installed in the ceiling that work well for hanging bikes, lawn chairs and even strollers in some instances. If there is room above the rafters for a storage loft, use the space for seasonal items such as holiday decorations or items you only need once or twice a year. Often a ladder or pull-down stair is the easiest way to access the space. Just be sure the floor is sturdy enough to support the weight of the items you plan to store and be careful climbing the ladder with heavy boxes or bulky items. With a little thought and planning, you can turn your fabulous new garage into a functional and efficient storage space that keeps everything in its place.